The hamos WRS complete PVC window recycling system removes contamination such as rubber, plasticized PVC, wood, metal, glass, foreign substances, etc. from ground PVC windows fully automatically. The flexible design of the hamos WRS line enables processing of off-cuts from both PVC profiles and also from used windows, roller shutters and similar materials. Due to the high quality and purity of the window regrind produced, this recycled PVC material can be easily introduced into processing of new plastic window profiles. This thereby guarantees a closed material circuit, from “waste” to new profiles. The core feature of the line is the hamos EKS electrostatic plastics separation system: hamos EKS electrostatic plastics separators free shredded and dust-free window regrind from rubber and other contaminants entirely automatically. Use is made here of the different electrostatic charges on rigid PVC compared with rubber, plasticized PVC and other substances. The PVC already has approx. 99.5% purity after this separation stage. Downline optoelectronic colour sorting equipment separates out the small amount of remaining rubber particles and possible coloured contaminants from the regrind. 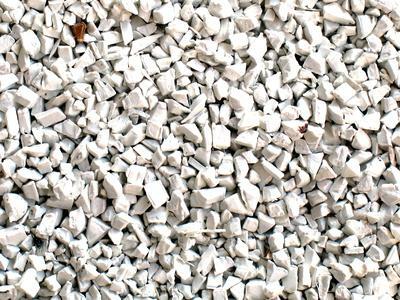 The final finished PVC regrind is furthermore characterised by a practically rubber free high-grade white quality. 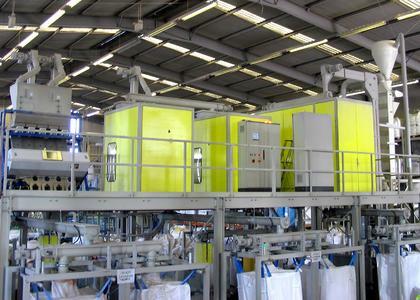 When desired, the colour sorting machinery can produce colour concentrated PVC regrind fractions from coloured regrind. Throughputs from 750 up to 3,000 kg/h are possible with the standard hamos WRS line. The type of finished material determines the technical arrangement of the separation line. 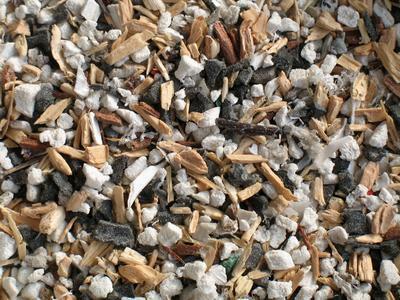 If window profile off-cuts from production waste are to be processed, then the material is only shredded and dust removed from it beforehand and it can then be fed directly into the electrostatic plastics separator. Processing of used windows or roller shutters is by contrast more laborious: aside from additional shredding and separation techniques, these types of mixed products require a further hamos KWS electrostatic metal separator. Such a separator separates out even very fine non-ferrous metal particles (aluminium, stainless steel, etc.) and other conductive materials, as well as, for example, used wood splinters. 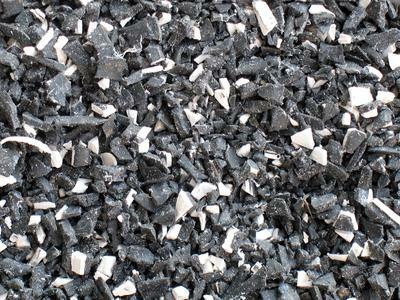 The fraction that has been pre-cleaned in this way is then fed into the electrostatic plastics separation system. Naturally, hamos also supplies the material logistics system needed for fully automatic operation. 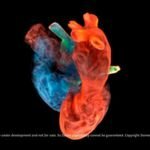 Combination of electrostatic and optical separation processes has proved itself many times. Almost one hundred percent clean PVC recyclate is produced on account of the high performance capability of the sorting equipment. The separation processes require low energy, work practically entirely automatically and are particularly economical due to the minimal separation costs. Rapid amortisation of investment in a hamos WRS recycling line for PVC window profiles is therefore ensured. 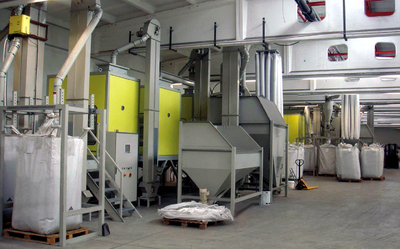 hamos GmbH presents the hamos WRS recycling line at the fensterbau/frontale 2010 fair. hamos GmbH Recycling- und Separationstechnik supplies equipment and systems for recycling and separation of plastics, cables, electronic waste, composite materials, minerals and many other types of materials. Aside from production and sale of electrostatic separators and lines for sorting and recycling, hamos attaches particularly high importance to research and development. Not only can additional application areas for the separators be therefore continually opened up, but especially also complete solutions for complex separation tasks developed. Aside from specific custom recycling solutions, hamos also offers turnkey recycling systems to process used PVC windows (hamos WRS), an electronic waste recycling system (hamos ERP) or a system to recover clean plastics from residual electronic waste (hamos KRS). The company is active mainly on a worldwide basis and presently has around 30 employees.